Autre Que Pur Sang horse (AQPS) loosely translates to ‘other-than pure blood’ and is a classification used for race horses in France that are not of pure English Thoroughbred lineage. They must have 75% English Thoroughbred and less than 5% Arabian blood to participate. The rest of the bloodlines can be a mix of regional French saddle horses (like French Saddle Horse and Anglo-Arabian). These horses are run both on flat tracks and in steeplechase races. 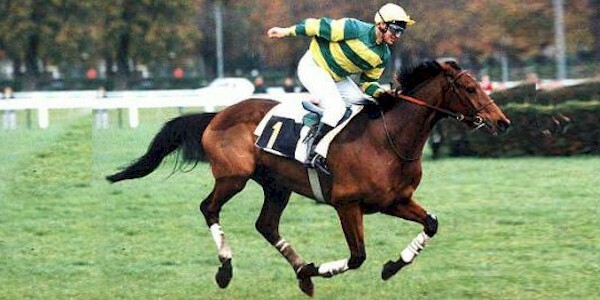 This mix is not as swift as the English Thoroughbred, although they prove to be sturdier and to possess more endurance. They often excel in obstacle races and longer distances against an open field. AQPS racing horses were developed around the end of the 19th century when French farmers began to cross cart horse mares with Thoroughbred stallions to produce a fast and hardy horse that has proven to be best suited for steeplechase racing. The average person most likely would not be able to see any difference between an AQPS and a Thoroughbred as evolution of the breed has resulted in AQPS horses today averaging 80 percent Thoroughbred and 20 percent French saddle-bred. Probably the best-known AQPS horse in the world is Al Capone II, who won the Group One Grand Steeple-Chase de Paris in 1997 plus seven consecutive Group One Prix La Haye Jousselin steeplechase races at Auteuil Hippodrome from 1993 through 1999. His full brother The Fellow won the Prix La Haye Jousselin in 1990, the Grand Steeple-Chase de Paris in 1991 and enjoyed even greater success in England where he won the King George VI Chase in 1991 and 1992 and the Cheltenham Gold Cup in 1994. Mon Mome, winner of the Grand National in 2009, is an AQPS horse, as is Orphée des Blins, winner of The Grand Pardubice Steeplechase 2012, 2013 and 2014.